Sleep Apnea is a sleeping disorder characterized by pauses in breathing or instances of very low breathing during sleep. Each pause in breathing, called an apnea, can last from at least ten seconds to minutes, and may occur 5 to 30 times or more an hour. Similarly, each abnormally low breathing event is called a hypopnea. 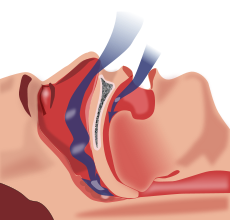 Sleep apnea is often diagnosed with an overnight sleep test called a polysomnogram, or “sleep study”.